How is it possibly May already? Typing away, the sun is shining and the birds are singing! Spring is most definitely here and that can only mean that Summer is just around the corner and with it event and wedding season is upon us. Although we’ve already had quite a few events and a wedding, summer is the traditional time to say ‘I Do’, however our season starts mid-April and continues through to September. Busy (but fun) times ahead! Intermingled with some corporate events (one tomorrow actually) and a few big birthday’s and special occasions this year looks set to be a big one. Before we have all these though, let us recap a little over the past 3 months. So what have we been up to…well you would think that these months are the quietest; not exactly! Although not literally, we have been making hay whilst the sun shines, in other words prepping for the many events and weddings that the year holds. We have been busy with tastings galore, looking at our menus and re-jigging them, coming up with some exciting new menus and ideas and organising ourselves and our staff ready for when it’s all systems go. We also have some exciting plans for our premises and are hoping to create and install something quite special! You’re going to have to wait for a few more details, but let’s just say it’s going to good! Amongst all of the prep and admin, we’ve had a weddings and events galore! It’s never really quiet for us! One of our lovely weddings fell on Valentine’s Day – how romantic! Guests were treated to a sumptuous buffet full of goodies and brimming with food. “I just wanted to touch base and say thank you for helping our wedding day be amazing! The lamb was the hit of the day as were the burgers and chips and the puddings were also super yummy! I wish I could do it all again and sit and eat it all again! You and your staff were wonderful on the day and really helped with the smooth running of things.” Such fab feedback received too, which always makes us smile! It’s fair to say we have been busy little wedding planning bee’s at the start of this year. As with the food and events side, in the ‘quiet’ months, it’s great to get everything in order, planning, prepping and generally making sure you are being productive and finalising plans for your summer weddings. All this, mixed with meetings and some tastings keeps us busy, but we do love this part when all the plans start to take shape and the couples can really start to see their big day coming together. Absolutely love seeing that! In addition to all of the planning, we’ve also been asked to help style a few wedding inspiration shoots and organise a couple of our own. We sadly can’t give much away yet, but once we know when they are published, all shall be revealed. We also had a few previous shoots feature on Bridal Musings, Fine Art Wedding Boutique You & Your Wedding Online and in Perfect Wedding Magazine and You & Your Wedding Magazine. The feeling you get seeing your work really is quite special; getting to be creative and working with some fellow amazing industry pro’s is just amazing and is something that we just love to do and help other suppliers do too. We don’t just plan, we also style and that seems to be quite a popular request currently; not only for fellow suppliers, but for couples who have the planning side nailed, but need some help with the creative side and bringing a vision to life. In this visual and social media driven world, couples are wanting to be more and more unique and décor and styling is one way to do so…mixing up linens, the way you fold a napkin or have a runner, installations and florals and various lighting effects. There are so many ways to inject personality and style and we totally love this part of weddings and events. Another biggy is on the day management, which we have a lot of this year. From doing over 500 weddings, we like to think we know a thing or two about the wedding day and if it means our couples can relax the whole day through, knowing we have everything sorted, then it works for us! We always aim to please! We also received some exciting photos this week from the fab Melia Melia Photography from a wedding we planned and catered for last year at Wickham House. Seriously dreamy images and we are so excited! We can’t wait to share these with you all soon. However with all this in mind, we have to get back to a final few plans and finish prepping! The smell wafting from the kitchen is H E A V E N L Y! Goose & Berry are a Luxury Boutique Catering, Wedding, Event & Brand Experience Planning & Design company who specialise in Weddings, Social and Corporate Events. We are based in Marlow & London and cover London, Buckinghamshire, Berkshire, Oxfordshire and the Home Counties. Did you know we also Plan and Design Weddings and Events! Happy New Year you lovely lot! We hope you had a fantastic Christmas and New Year. 2017 has arrived and we are back at work and ready for all of the exciting events and weddings ahead of us. Our December was full of Christmas parties galore and lots of super fun events. In amongst the canape and drinks parties, we had some dinners mixed in and some festive lunches too. Christmas parties are all about the fun and the festive treats, think mulled wine, Christmas cocktails and a few hundred or so mince pies to boot! Turkey, trimmings, beef wellington and some seriously tasty sticky toffee pudding. 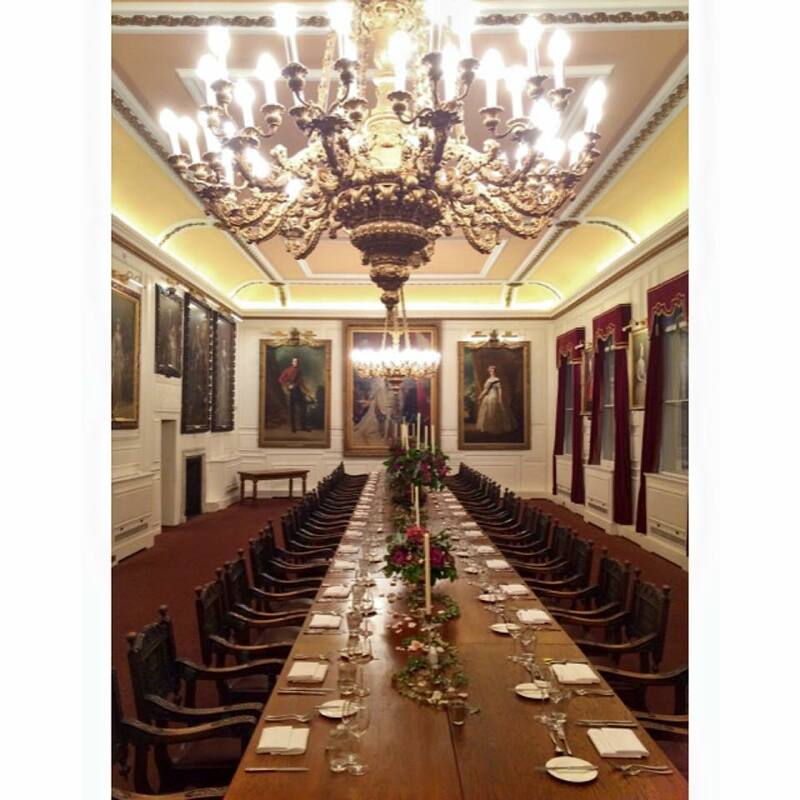 We were lucky enough to be back at Windsor Guildhall for a Christmas Dinner and it really was a beautiful setting. We also got to provide some cute Christmas canapes for the lovely ladies at B.loved for their festive mingle. We were also invited to a few Christmas parties and gatherings ourselves where we got to catch up with fellow wedding industry pros and celebrate the year with some festive cheer. One of the highlights included a scrummy afternoon tea at The Bingham – such a beautiful hotel in Richmond, with a riverside setting that is ideal for weddings. December certainly flew past and we can’t believe it’s another year and January already! As event and wedding professionals, people always ask us what we think will be popular in the forthcoming year…well here is our top 5 predictions for weddings and catering. Greenery – Pantone’s colour of the year is Greenery – quite a vibrant bold green which is quite the contrast to last year’s pastel hues. Whether used as a theming throughout your wedding or event, we think foliage will be used in abundance and in a loose, wild and natural way. Tropical – The tropical trend was popular last year, but mixed with the Greenery, we think this will really take off. Long reign the pinks, oranges, flamingos and pineapples! Industrial Luxe – Think copper, marble and warehouses with metal, stone and metallic elements, mixed with geodes and geometric contemporary designs and décor. Foodie Heaven – couples want to go BIG on food and splurge a little. Food after all is a big part of the day! Choosing their favourite food and going all out, matching wines and drinks too. P.S – keep any eye out for completely raw, vegan and gluten free menus too! Food stations and informal catering will be key – as will drinks stations. We have no doubt that artisan gins and craft beers will be big as will botanical drinks. Are you getting married in 2017? Will any of the above be featuring? We would love to know and find out more about your plans. We have a busy January ahead – focusing on some upcoming weddings and events and finalising plans, also prepping for a Valentine’s wedding too – how romantic! November has bought a wonderful mix of lunches, dinners, weddings, Christmas parties and a big country show, all completed by a super exciting award! We are absolutely thrilled and delighted to have been voted the English Wedding Awards South East Caterer! How fabulous! This has made our month and year, so thank you very much. We have some lovely events this month. November has certainly seen the festivities begin and we’ve had a few seasonal gatherings – from brunches, to lunches, buffets, canapes and cocktails and some elegant dinners. We get to incorporate some festive and seasonal produce and our cinnamon and mulled wine poached pears are proving popular as is our Venison main. Towards the end of the month saw a couple of weddings at Micklefield Hall. The barn lends itself beautiful to Autumnal and Winter weddings and we had rich reds and some elegant navy and white tones used as the décor. 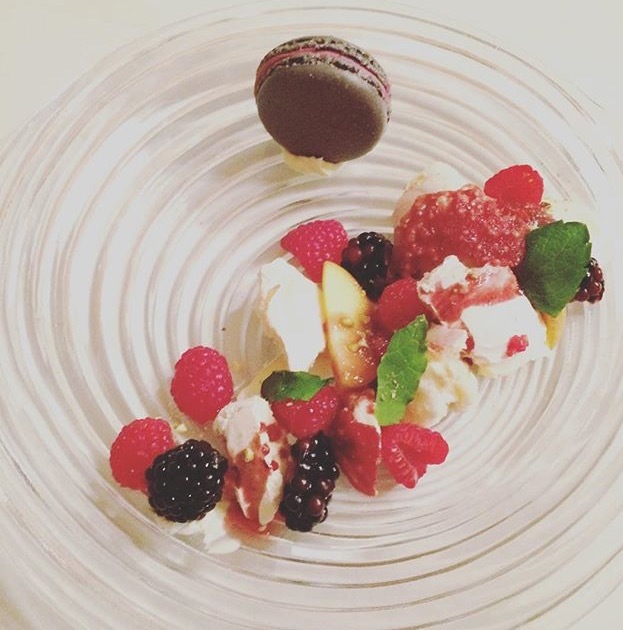 Berries were still popular as ever and our winterberry mess went down an absolute treat! We took the mid of the month to finish off some tastings for events early next year and also start to look ahead to December where party season will truly have its hold on us. We also released our full raw, vegan and gluten free menus for wedding guests. We are the first caterer to do so and can’t wait to get creating some raw magic in the new year for our couples and their guests. Finishing off the month we catered for 3 days and thousands of visitors to the Country Homes & Interiors Christmas show at Stonor Park. Visitors were treated to seasonal and Christmas coffee’s and hot chocolates, festive sweet treats and savoury snacks such as our local pies, which were raved about by the end of the weekend! We absolutely loved being there and being part of the show, enjoying getting into the Christmas spirit. It’s fair to say we could have spent a small fortune on some of the wonderful gifts on offer – our office may be featuring some of the decorations on show. Following on from last month and quote gathering, November saw a little more and finalising some suppliers for next years’ weddings. It’s so good when everything falls into place and means that our couples can relax and enjoy the festive season, assured that all is booked and the fun of the details and styling lies ahead. As members, we attended an NAWP event too, which are always good fun; getting to catch up with some familiar faces and meeting new. Networking events are always good to make some industry friends and catch up; all whilst trying some drinks and nibbles at a new venue which you may have not yet discovered. This was the case on this occasion. The event was held at the Museum of the order of St John and wow, it really is a stunning place. Hidden in Farringdon, we had no idea it was even there, but are so pleased we are now. It’s so beautiful and the spaces and history are quite magnificent. We also got to visit ‘Elevate your senses’ Wedding showcase at the Shangri La hotel at the Shard. Even on a slightly rainy day, the views were incredible and it was lovely to see some of our faves; Armorial, Emmy Shoes, Twobirds Bridesmaids and Abigail Bloom Cakes. Last month we mentioned how delighted we were to have our Autumn Copper inspiration shoot featured on B.Loved and we are still loving the tones and autumn vibes the shoot brings. We’ve had a bumper month of features and we have been featured once again in Your Berks, Bucks and Oxon Wedding Magazine for a styling feature and earlier in the month we had our stunning Jane Austen Georgian Serenity shoot featured on top US blog Burnetts Boards – how amazing! You can see a little more here. It brings back fond memories of Spring, which was a warm welcome in these chillier times! Here we are, Autumn has arrived and with it the leaves start to fall, temperatures drop and we are getting cosy. That said, haven’t we seen some stunning weather in Sept – holding on to the last bits of summer but ready for the cooler months ahead, or maybe that’s just me ( I LOVE Autumn!) So, our September has been a truly wonderful month, filled to the brim of awesomeness in the form of some stunning weddings, one of which we planned and a couple of super fun corporate events. Mixed with a few tastings, some super exciting meetings and an interesting morning filming, this has been one busy but enjoyable month! We started off the month in wedding mode. One at Micklefield Hall and one at The Walled Garden at Wasing Park. A&S had their wedding at Micklefield, which we were also entrusted with our on the day management. Full of beautiful rustic and whimsical details that worked so well within the barn and luckily the weather held out for a pretty outdoors ceremony. We created a delicious menu for them where guests were treated to a yummy three course meal all followed by pasties galore – proving popular with the Cornish family members! N&B’s wedding at Wasing again had an outdoor ceremony and their wedding had quite the festival vibe with a fab tipi and cute details at the bar and on the dancefloor, with a rather unique drinking game – wheel of misfortune anyone? Their patisserie station was quite simply divine and not a pud was left in sight. Mid-month saw a flurry of corporate events. One being at Windsor Guildhall with a very royal theme. All British produce and theming for the menu and drinks and a thoroughly elegant and regal affair. We also hosted one of our regular clients re-branding soiree. Plenty of delicious canapes and copious amounts of champagne were flowing. They always know how to throw a good party! Ending the month nicely saw S&A’s wedding and us return to Micklefield Hall. Pretty pastels and purples filled the barn and a rather scrummy menu of fig and goats, cheese, lamb and choccy pud followed, to the tune of “best wedding food ever”…we’ll take that! In between catching up with some wedmin for weddings next year and a couple of styled shoots – keep those eyes peeled – mid month saw the floral fantasia wedding of H&A at Wickham House, within the walled garden. With a brief of natural beauty that exudes happiness, we set about creating a floral work of art within the most gorgeous of gardens I ever did see. Taking inspiration from the blooms around us, we created a space in the sunken lawn that merged into the space beautifully. Using a stretch tent to do so and create a dining space worked so well and allows the flexibility that was desired. Florals were key; bringing in a rich and slightly woodland and forest feel with some richer tones and mixed with the ethereal beauty of the pastels; all mixed with feathers, butterflies and mushrooms. Honestly, just wait until you see! We created a humanist ceremony space underneath a tree within the grounds and dreamcatchers flowed in the breeze before a butterfly release, which was just magical to watch. To end the month we also were treated to ‘Enamour’, Amie Bone’s absolutely magnificent and breath-taking display at The National Wedding Show – just look at the pics, need we say more! As we sign off, we are finalising plans for something rather exciting and 2 shoots in October – one foodie based, one wedding based…all shall be revealed soon! August has given us two of our biggest events and two rather big weddings…which have been super fun! The first biggy was mid-way through with a glorious marquee wedding set in the most picturesque of gardens. It had a midsummers garden theme and the florals were so impressive! Guests were served from a rather salubrious gold bar –what else and sipping champagne and gin cocktails, it set the scene magnificently. A delicious feast of figs, beef fillet, a trio of puds and our delightful edible garden were served, along with a selection of cheese and a round of fish & chips to finish the evening. Our kind of meal! The second biggy was just at the end and set in a quintessentially English setting, was just truly scrumptious in every way! This wedding had a more relaxed and informal feel in the way of our gourmet BBQ’s, which on such a beautifully sunny day was just super and guests loved it! Amidst these two, we’ve had a few other smaller events and afternoon tea galore, which has proved popular this month. We do love afternoon tea and if you’re having a garden party, then this is the perfect fit! After a rather busy July, our August is keeping up the momentum and we are still going strong through Wedding season. This month has mainly consisted of finalising plans for a beautiful intimate wedding in September and we’re really looking forward to this one. Set in a beautiful walled garden with the most glorious planting and florals, it’s going to be an absolute floral fantasia – that’s what we’re calling it anyway! It’s going to be filled with some wonderful DIY detailing and an abundance of colour and a serious flower fest with some amazing food. We’re particularly looking forward to a bit of a vegan and health vibe which we can’t wait to try (perks of the job and all!). Mid-month we were treated to a wedding breakfast at the seriously stunning Corinthia Hotel in London. Along with several other superstar planners, bloggers and editors we enjoyed a glass of fizz followed by a delicious breakfast and cake. We also got a tour of the spaces, restaurants and a penthouse. We’ve already decided that we are going to move in –it’s so us! Great Hire provided some fabulous ghost tables and chairs which looked amazing within the Ballroom setting and paired with some wonderful tableware from the amazing Duchess & Butler and some beautiful florals by By Appointment Only it created the perfect setting. It was lovely catching up with the gorgeous Abigail Bloom who provided the most amazing of cakes. We also got to chat about the super tasty cakes she provided for one of our couples in July – the chocolate cake was DIVINE! The remainder of the month has been filled with venue visiting at the glorious Stoke Park (where we are a preferred supplier and will also be at their Wedding Showcase in October) and Wisley Gardens and gaining an abundance of quotes for a wedding next year and we can already tell it’s going to be a good one! Well July really was the month for Weddings and we have catered for some rather wonderful ones and all in some seriously amazing locations. This month saw a mixture of marquees, gardens and stately homes, each providing their own merits and we have been lucky to work in some seriously fabulous venues. In the earlier part of the month, we catered for a wedding that we also planned (see more below). 150 guests were treated to some delicious canapes and one of our favourite desserts finished the meal; you really have to try our Lime Posset – yummy! The rest the month saw a mixture of formal sit down meals, some fancy buffet’s and a couple of Gourmet BBQ’s with some seriously tasty treats on offer. If you have a more informal wedding and it happens to be a beautiful summer day, then our Gourmet BBQ’s are the best; they work so well in an informal setting and provides the taste and presentation without the formality of a plated service. Great for a festival or more boho affair and also amazing for Birthdays. The Birthday’s we catered for opted for a relaxed BBQ too and we were thrilled to plan and style one of these too. The clients had a joint birthday and anniversary party with a customised bar (and champagne flowing until the wee small hours) and opted for a stylish Mediterranean feel to their décor. Banquet style tables were dressed in stunning foliage wreaths with herbs mixed in and foliage chandeliers hung upon the entrance, creating the most stunning welcome for guests. Thank you to Lily’s Flowers for these! We ended with a rather grand affair at the most picturesque of venues and can’t wait to work there again. Guests were treated to the most splendid of views whilst sitting for dinner and the ceremony space – serious WOW factor. A wonderful way to end the month! What a month! This one has quite simply been wonderful! So so lovely. We had two weddings that we have fully planned and styled and although July has been our busiest month so far, it’s been really quite dreamy, with two of the loveliest couples that I hope will remain friends with us for many years to come. We started the month with the wedding of C&R, a super stylish couple from the States who fell in love with England and particularly Windsor on a visit a few years back and once engaged, knew that this would be the place for their wedding. With this in mind, we opted for a slightly formal English garden party affair with a Gatsby edge; think Downton Abbey mixed with the Gatsby party vibe and style. Hosted at various locations at Windsor, all 70 guests were flown in from across the States to join in a weekend celebration of fun, food and partying. A proper English pub meal on the riverside was the order of the day on the Saturday evening, with the main event on the Sunday. Dressed in garden party lounge style dress, the glamorous couple and guests attended the ceremony at Windsor Guildhall before heading to the river and setting sail on board a beautiful launch from the French Brothers. Guests enjoyed a traditional afternoon tea whilst listening to Jazz and enjoying a lazy trip along the Thames, taking in the sights of the English countryside. After this little jaunt, guests made their way back to the Sir Christopher Wren hotel for cake, cocktails and canapes, all followed by a fabulous feast. The highlight of the evening was a 10 piece swing band (The Mini Big Band) who really got the party started, they were serious fun! We worked with some wonderful suppliers including Patrick Collins who is an ace Toastmaster, Abigail Bloom – just look at that cake, David Bostock – photographer extraordinaire, Classic Crockery (fab cutlery and charger plates which really highlighted that glam Gatsby feel) and Lavender Green who provided the most stunning of florals! We can’t wait to show you more pics from these weddings and particularly the video, which we already know will be A M A Z I N G! There is so much to tell, but we shall keep it brief for now and once the images are back, we will share the love with you lovely lot. A huge thanks to all the fab suppliers involved, serious dream team’s right there! In other news, aside from finalising some fab plans for a Sept wedding, which is going to be soo floral and fabulous, a couple of our wedding inspiration shoots have been featured and we could not be more thrilled! Check out the links for the full description and suppliers for this wonderful Rustic Botanical and Romantic look at Le Manoir featured on B.Loved and for the other, well you have to go and buy the most recent You & Your Wedding Magazine! Oh yes…and we just happen to be now be one of Stoke Park’s preferred wedding planners and stylists! So another month has passes, all too quickly I might add and this one seems to have been even busier than last (not that it is a bad thing!). As the wedding seasons picks up, we’ve had some wonderful weddings and events, which we of course love. We’ve had a lovely mix of events to cater for this month. A few weddings, a milestone birthday and a corporate VIP function. To start the month, we created a rather delicious patisserie station for some super lovely clients who were brought to us by the amazing Dominique at Stylish Events. A patisserie station adds a bit of a wow and fun factor to any event and if you want something a little different to just a plated dessert or a trio of puds, then this is the way forward. The clients and their guests loved it and it’s always good when you get feedback such as “the best ever” when describing our Chocolate Trifles. One of the perks of our job is seeing some special moments, which we were lucky enough to witness at one of the Birthday parties this month when the Birthday boy’s sister surprised him, coming all the way from Australia. A few tears may have been shed by Team GB; yes we love a good sentimental moment! The setting was also a treat too; a beautiful picturesque cottage and the marquee looked super pretty with colourful garden blooms. The water glasses we chose picked out the colours beautifully. As mentioned, wedding season is well underway and we had a biggy in the middle of the month. A dreamy marquee setting (despite the horrid weather) and a fab bar space. We love working with clients to design their dream wedding and give ideas about how everything will look. The menu chosen for their wedding was also a particularly good one and the feedback we received about our fillet of beef – well it was something else. Beaming with pride is an understatement! Corporate events are always fun to do and mix up the social and wedding side of events. We catered for a 100 VIPs at Windsor Guildhall, which is a seriously impressive dining space; imagine eating supper overlooked by all of our previous Monarchs. That’s one way to impress all the big bosses of the organisation! The month started in the most wonderful of ways . We had organised a styled shoot at one of the most super stunning country houses (serious swoon worthy status right here) in the Cotswolds, Cornwell Manor. Obviously I can’t give much away, but you are in for a treat when the images are revealed, so keep those eyes peeled! The following day we got to spend the day there again, in the most glorious of sunny weather, at their Wedding open day, launching the newly refurbished Ballroom and Walled Garden. We met some wonderful new suppliers who were all lovely and so much fun to spend the day with, also some fab couples who were just in instant love with the venue and gardens. Simply cannot wait to work here again, soo many ideas and it really is the most glorious of country wedding venues. The remainder of the month we’ve been a busy little bee’s putting final touches to two summer weddings we’re planning. We just love confirming all final details and creating the final schedule. Just over a month to go for these lucky couples and I know they are excited and the same can also be said for me…roll on a few weeks’ time! The big wedding we catered for in the middle of the month, we also wedding managed on the day. I ADORE on the day wedding co-ordination and managing. This is what I know inside out from my background at venues and I just love it. Even if you aren’t having a wedding planner to do the full planning, it’s so worth hiring an on the day co-ordinator. It means that you have someone there to take away all the work in the morning from you and your family, meaning you can relax, enjoy the getting ready and not worry about suppliers arriving and things being set up. That is our job; there to take away any stresses and organise suppliers, staff and set up, ensuring all goes to plan, on time and everything is smooth and seamless and that you get the wedding of your dreams. Seriously worth considering! Who can resist the temptation that these lovely oval chocolate goodies bring. The Easter Egg has long been enjoyed by many generations and continues to do so (I bet you can’t wait until Sunday!). However, we’ve noticed a bit of a change in the offering that the chocolatiers are bringing us at this time of year. Eggs are becoming fabulous works of art, with wild and wonderful flavours, leaving us with serious hunger in our eyes and belly. Check out the Easter Eggstravagance we have discovered in the shops. What will you be tucking into on Sunday morning? Will you be dining out on an Easter Eggstravaganza or keeping it simple with egg and soldiers? A clue as to how our Sunday will look…surrounded by packaging and a room that Choccywoccydoodah would be proud of! So you think you can plan? When I tell people I work in events, they look at me enviously and tell me how much fun I must have; they imagine I spend my days eating macarons, sniffing peonies and sipping champagne, all at fabulous venues of course. There is some truth behind this; I couldn’t work this hard if there weren’t a few perks along the way to sweeten me up, but of course there is another side to event planning…. The reality is spreadsheets, piles of data and directing suppliers out of muddy fields at 12am in wellies and rain, (me circa Saturday night). Not so glamourous right? With the dreamy perception of a planner’s daily routine, I can fully understand why I receive so many emails from bright eyed hopeful event planners hoping to break into the exciting world of events. It can be heavenly at times and we do tend to only include the super fun parts on our hashtag lifeofaplanner intsa feeds…oopsy. I don’t enjoy my job 100% of the time. I work insane hours and on event weeks, I might work between 14-18 hours a day for three days with barely time for a bathroom break, let alone a break, break. Unless you are working in the Corporate Events world, you can also forget your relaxing weekends. ‘It’s Friyay”…. no, no, no. Friday means work is just beginning and ‘Saturyay’ is going to be filled with your colleagues rather than loved ones, sore feet, huge amounts of pressure and an M&S sandwich if you’re lucky. So my point is, unless you are a super hard worker and don’t mind working unsociable hours, then don’t even try to persuade yourself this is your ideal career. What is the right event route for you? Decide what it is that makes you yearn to be involved with events: food, design, brides, hotels, fashion, corporate, launches, charity, luxury, multi-day conferences etc. There are so many different types of events so try and be clear from the start what it is that you are going to enjoy working on every day. Contact a few companies that you admire and offer to work on an event as an assistant (don’t expect to be paid – we do because we’re lovely, but many don’t). Working on an event is the best way to see if you really enjoy it, rather than signing up to lots of expensive courses and taking the chance if it is not for you. If you do gain some work experience then ask if they would write a reference for you to show to a future employer. Also keep in contact with them, as they may have positions available in the future. When my current Director of Weddings contacted me about working with Goose & Berry I had no openings, however she kept in contact and when we had a new role available the job was hers. For me, the thought of having to text back friends is a chore itself, let alone constantly networking with businesses, however you must learn to deal with it. We have created many fabulous relationships and generated masses of new business from social networking. There are so many wonderful people in this industry and following what they’re up to fills you with creativity and excitement. If you don’t have Instagram and Twitter, you should do; you must be on top of your social media game. Start following everyone that you admire – brands, marketing, events, caterers, wedding planners, venues, PR – anything relevant or inspiring. Interact with them as much as you can and don’t be afraid to congratulate and take inspiration. There are some wonderful blogs with fresh content to keep you excited (I’ve heard the Goose & Berry Blog is pretty awesome). There are also some great magazines you can read to keep you in the knowledge of what’s current and a great insight into the trade to keep you business savvy. You’ll be surprised how much companies check out potential employees on social media and coming across as passionate, interested and knowledgable will work wonders for your credibility. So you’ve decided this industry is right for you? Great, time to start looking attractive to potential employees. Compiling a creative CV is crucial to getting you spotted. Think of your CV as more of a portfolio of what you have accomplished and what you are capable of accomplishing. I’m impressed with straight A*’s, but more impressed by experience, skills, and creativity. Include images of any work that you may have already created. Create a mood board and event plan for an event you would love to create. Offer to help any friends and family with events they might have coming up and get lots of good photos from these events. Style the christmas table, offer to help make invites for a friends wedding, organise a friends baby shower dessert table and so on. If you have a niche then work on it – flower arranging, designing invites, styling, beauty, baking, hair etc. Create little projects for yourself and get as many fabulous images as you can. If employees can see that you have a creative talent, then they will appreciate your skills may be transferable. We spend 90% of our time behind a desk, so great computer skills are a must. Specialist applications will set you out from the rest – spreadsheets, a whizz on photoshop, design packages – anything creative or organisational based will be a huge draw for event companies. If you approach a company with experience or a portfolio of what you are capable of, they are more likely to be interested rather than approaching companies stating you are ‘hoping to get into events’. I have emails from people all the time writing this and it makes me concerned that they have no experience, they will need to be taught everything from scratch and if I do give them a chance and invest time into training them, then they may change their mind and decide the events industry is not for them. Contact any companies you admire and ask if they might have any part time, full time or internship rolls available. It might not be in a position you want but once you get your foot in the door you can commence the dazzling process. Be careful about accepting a non-paid internship for a non-established company; make sure it is one that you really admire and appreciate their work. There are so many styled shoots happening at the moment so why not contact Wedding Planners and ask if you can assist on the day. You may be making cups of tea or carrying a brolly to shelter a model, but sometimes there are up to 10 suppliers working on these shoots so this would be an invaluable opportunity to network. You could also try venues – there are so many luxury hotels that often hire wedding coordinators or events and banqueting assistants, even bar and waitressing jobs – these are great roles to begin with so you can gain some great experience. Experience at a luxury venue will add prestige and weight to your CV. Look at planning and/or design courses that you might want to attend. There are so many different courses so be choosy about what you sign up for. You want a course that offers a ‘ hands on’ element. You can’t learn how to deal with clients, win business or problem solve from a text book. Working in the Event and Hospitality Industry is not for the faint hearted, so make sure that whatever event route you take* it’s one that you enjoy. * always ALWAYS wear flats on event days. Goose & Berry are a Luxury Catering, Wedding & Event company who specialise in Weddings, Social and Corporate Events. We are based in Marlow & London and cover London, Buckinghamshire, Berkshire, Oxfordshire and the Home Counties. At a venue as prestigious and stunning as the Windsor Guildhall, you know the guests will be in for a treat when they choose to hold their dinner there. A beautiful building dated from the late 1600s, situated by Windsor Castle, famed for the wedding of Prince Charles and Camilla Parker-Bowles, you can get married here and also hold receptions, dinners and events. Goose & Berry are proud preferred caterers at Windsor Guildhall and one early October evening saw our first event held there. We catered for a VIP corporate dinner of nearly 40 guests from Vapotherm, visiting the UK, where a fine three course dinner was served, after the guests had been treated to a tour of Windsor prior to their dinner. Once the guests had sat and the wines poured, starter was served. 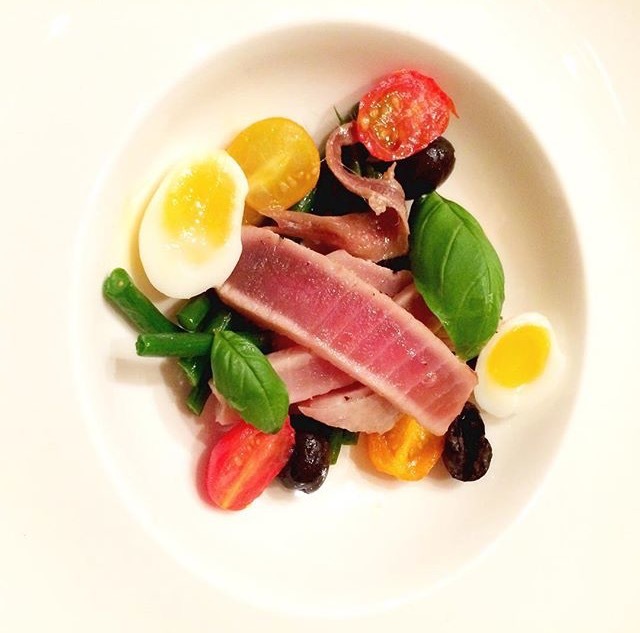 A beautiful and light Nicoise Salad was the dish of choice for the first course. Followed by a sumptuous and rich Beef Bourginon. Perfect on an Autumnal evening and sure to please. The dessert was a deconstructed seasonal Eton Mess. Quite appropriate being located metres away from where the pudding originated and a perfect ending to dinner! Coffee’s followed to round off the evening and lots of lovely comments ensued, which is always a delight to hear! Windsor Guildhall is such a fabulous setting for a dinner, event or wedding. Grand, but not too imposing and such fabulous rich history. We’re already looking forward to the next event there!